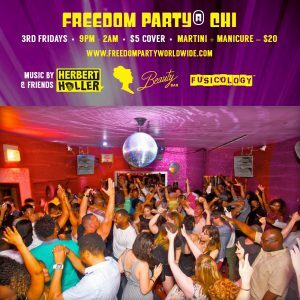 THE FREEDOM PARTY® is NYC’s most legendary old-school dance party! Created in 2003, Freedom’s purpose is to bring different people together through a classic NYC dance party. Playing predominantly hits from the 80s, 90s and 2000s, be it hip-hop, R&B, pop, rock, reggae or house, Freedom fills its 15th year of dance floors with people from all walks of life, all ethnicities, races, creeds and colors, from all over the world, looking to have fun, celebrate life, make new friends and be free. NYC’s longest running, most legendary old-school dance party hits Beauty Bar Chicago for the illest old-school jam in the Midwest. We got a sick sound system, a bona fide dance floor, affordable drinks, and hundreds of the nicest folks from all walks of life vibing together to the sounds of old-school hip-hop, R&B, reggae, soul, funk, disco, classic pop and house by Herbert Holler and friends. JUST $5 TO GET IN! MARTINI + MANICURE = JUST $20!